My interest in refurbishing Baroque vanitas paintings--emphasizing the ultimate mutability of life on earth, death's certainty, and spiritual transcendence--as photographs in a natural environment remains strong. So I've gone back to the deer carcass the dogs had found a few days ago to document it properly. Unlike another recent vanitas featuring an animal skull, these images are not staged. 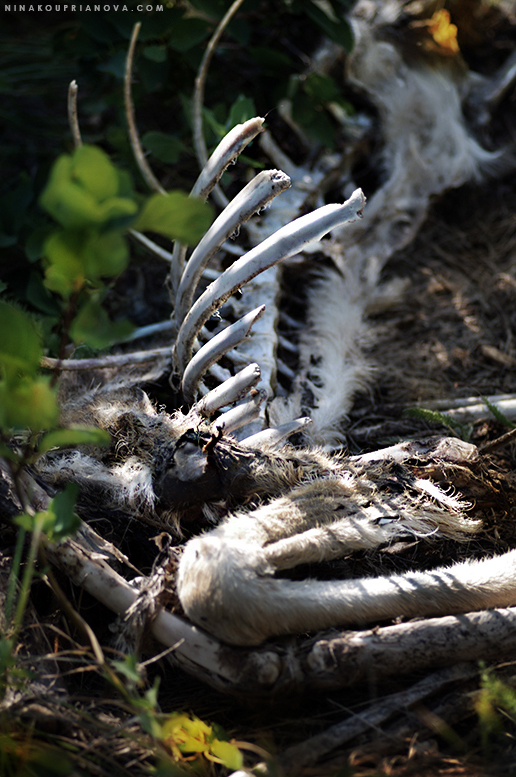 Of course, the said carcass happens to be located in an area known for bears and mountain lions. The latter doesn't make me feel entirely comfortable, considering that I lose all my normally decent observation skills for the outside world when I'm photographing. (And what would a photoshoot be like without having Japanese rockers serenading and sometimes screaming into my music player's headphones? ;) ). As a result, I couldn't stay for long.